CORONA, CA -- CIRCOR Aerospace Inc., a CIRCOR International company (NYSE: CIR), has been awarded a contract by the Defense Logistics Agency to supply its newly designed Nose Wheel Steering Actuator (NWSA) for all models of the F-16. The NWSA’s primary function is to provide steering control to the pilot during ground and taxi maneuvers. The NWSA was designed and qualified by CIRCOR Aerospace and provides improved reliability and maintainability over the existing design. CIRCOR’s unit is a drop-in replacement, requiring no change to current installation or operational procedures. The CIRCOR Aerospace NWSA design is approved for domestic and foreign sales for the Lockheed Martin F-16 Fighting Falcon fleet of over 4400 aircraft. The value of this initial contract for the CIRCOR NWSA exceeds $3.7M USD. 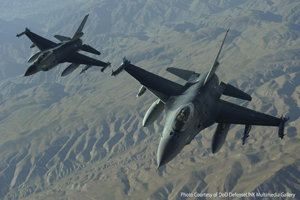 “CIRCOR Aerospace is proud to offer this improved capability to the F-16 operators. It highlights CIRCOR’s ability to provide actuation solutions which drive increased performance for new and existing platforms,” noted Anish Patel, VP New Business Development and Strategy.